If you are like me you like to research what you buy especially if you are replacing your old cooking products with unfamiliar technology. There is a lot of hype and literature about induction including several blogs written by Yale appliance experts. Generic (non-Yale) sources tend to use a lot of complicated vocabulary to explain why this technology is so great. Anyone who went to school with me knows that I am not particularly a genius when it comes to science. I found these sources boring and frustrating. In this article I will do the translating for you so that you can have a solid understanding of the science behind induction. I will start by providing a simplified overview of induction science, explain why it is better than any other cooking technology, and then feature some great induction cooking products for you to consider. Induction seems too good to be true… Exactly how does it work? People have been cooking food in a pot or pan over a heat source for centuries. Traditionally a pot or pan was a barrier between the heat source and the food. The main issue with this process is that the heat source only directly heats the part of the cookware that it is touching. Therefore food receives different amounts of heat from different parts of the pot or pan which can result in uneven cooking or scorching. It is also inefficient. Induction uses electricity and magnetism to transfer heat from the coils underneath the cooking surface directly to your pan essentially making your pan the heat source. It does this by using electromagnetism. As the word suggests electricity and magnetism are closely related. Anyone who has used bar magnets before knows that they have two poles and can either attract one another or repel. Electricity is the presence and flow of electric charge. Everything in existence has some form of electric charge. If you can think back to when you took science you learned that atoms, the smallest pieces of matter, have protons (subatomic particles with a positive charge), neutrons, and electrons (subatomic particles with a negative charge). That is the extent to which I like to talk about science. However, I will do my best to explain (in English) how induction works. When the cooktop is activated it runs a current through a coil under the cooking surface. The coil creates a magnetic field that is constantly switching poles. The cooktop can only work if it detects cookware on the burner surface making induction not only the fastest but also the safest technology. When you cook only the pot or pan gets hot, not the cooktop surface except from a small amount of residual heat from the pot to the cooktop. If you have poorly behaved cats that are curious about what you are about to cook they cannot get hurt walking across an empty cooking surface. Only when the cooktop detects cookware with magnetic properties, it creates a charge in the pot or pan. The magnetic field created by the coils under the cooktop surface excites subatomic particles in your pots and pans. You're probably wondering what that has to do with heat. Most of the heat used to cook on an induction cooktop is generated from electrical resistance. When a current is run through a material with a high resistance, much of the current is converted to heat. Materials like iron and other metals with magnetic properties are poor conductors of electricity they therefore have a high resistance. Induction will not work unless you use pans that have a high ferrous metal content. Ferromagnetism is the type of magnetism that you can physically feel when you pull paper clips off of a bar magnet. A simple way to test if your pans have ferromagnetism is to stick a magnet to the bottom of your pan. 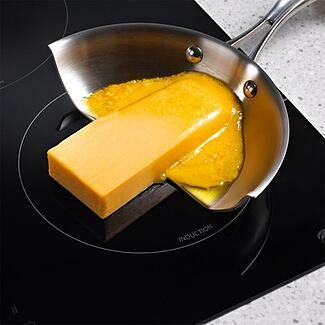 If the magnet will stick, your pan will work on an induction cooktop. Iron pans work well on induction surfaces in particular because they have high resistance. I am not the most patient person especially when cooking. We live in a time where we are living at a faster pace. If all the other technology we use in our daily lives is getting faster then why shouldn't cooking? To accommodate for this push for technological innovation the appliance industry has increased research and development to raise the efficiency of products and to incorporate technological innovation to meet the needs and interests of consumers. Induction solves the waiting problem.  Most induction products boast that water will boil in 90 seconds. Induction is faster than the hottest professional gas stove. Magnetic technology is the newest and fastest, but it has been around since the 1980s. Gas and electric cooking are very similar to the early units designed in the 1920s. Gas has just become hotter over the years. I have never met anyone who enjoys cleaning. I particularly don’t enjoy waiting to clean for that matter. Traditional gas and electric cooktops are very hot to the touch after you are done cooking. You must wait a long time before you can safely clean up after dinner. Induction cooktops have a glass ceramic finish which is easy to wipe down after cooking. Not only are induction cooktops easy to clean, you don’t have to wait to clean either! With induction technology only the pot or pan is heated, not the cooktop. After cooking with induction I can comfortably place my hand directly on the burner. The burner is a little warm because the bottom of the cookware was hot, but again you can touch it comfortably. You can actually eliminate cleaning altogether by placing a dish towel over the cooktop surface before placing your pot or pan on the cooktop. When you are finished cooking you can throw the dish towel in the laundry. There is a giant cultural push toward saving the environment (for good reason). The appliance industry caught onto this trend several years ago. Most appliances sold in the North American market are Energy Star rated. Induction is the most energy efficient technology because the pan is your cooking surface. There is very little heat that escapes your pan saving you time and money. Induction technology does not produce a lot of residual heat like traditional gas cooking where heat escapes the sides. Because there is way less residual heat, you do not need a professional hood and unlike pro gas, you can also downdraft an induction product. Whether you are planning to remodel your kitchen or replace an existing 30’’ range there is an induction product out there for you. Previously induction was only available in the high-end brands however due to its popularity many affordable luxury brands developed induction products too. Prices of induction have fallen as induction has become more commoditized. Below is a list of great induction products at a variety of prices. KitchenAid is a popular brand in the North American market. 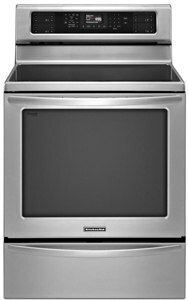 They came out with a great affordable induction range with a convection oven and warming drawer to fulfill all of your cooking needs. Electrolux appliances have a modern appearance and great technological features. This range is a slide-in giving it a built in appearance. 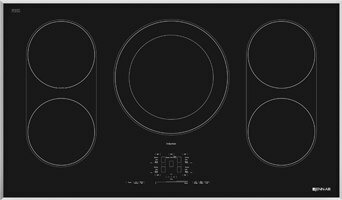 In addition to induction cooking technology it has a double oven and the most automatic control settings at this price point. Electrolux also makes a freestanding induction range. What a great value for an induction cooktop! This model has 5 burners with electronic controls. Frigidaire typically offers good package rebates too. 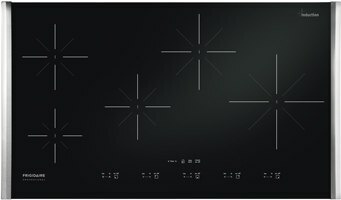 This is the only induction cooktop with bridge elements connecting the front and back burners. Bridges are good for large skillets and griddle pans. 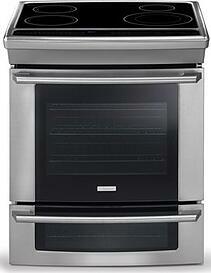 Jenn-Air has good rebate programs with free dishwashers and hoods with qualifying purchases. 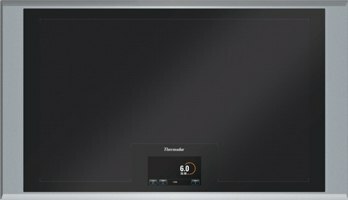 Although Thermador makes other induction cooktops at a more competitive price point I decided to list the Thermador Freedom cooktop, the coolest induction product out there. The whole cooktop is essentially a large burner so you can place your pans anywhere on the cooktop surface. You no longer need to worry if your pans will fit the burners. Download the Yale Induction Cooking Buyers Guide for features, specs, outputs of every induction range and inside tips to every brand. Over 40,000 people have read a Yale Guide.